In the thriving city of Gladstone, in Central Queensland Australia, you'll find a range of accommodation facilities including first class hotels, motels, serviced apartments and backpacker accommodations. Gladstone has a limited number of hotels, although it has a substantial number of motels. 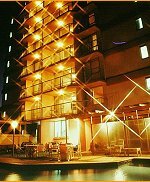 The two main hotel/motels in town are the Metro Hotel and Apartments and the Country Plaza. The Metro is an apartments/suites hotel/motel consisting mainly of one bedroom apartments accommodation, whereas the Country Plaza Hotel is more of a traditional hotel. Gladstone is a thriving city in Queensland and travel and tourism is a growing industry. Many tourists stay in hotels and motels in Gladstone whilst exploring nearby Heron Island and the southern parts of the Great Barrier Reef.